Today's review is about a passionate vampire who will do everything in his power to never hurt a soul again. After Draven Delano fled his coven, he vowed he’d never take an innocent human’s life again. To survive on his own, he became a doctor, allowing himself easy access to blood bags and a means of survival without harming a soul. But an immortal can never stay in one place for too long. And he can never fall in love. When he moves to the sleepy town of Burn Falls, he thinks he’s found the perfect place to temporarily settle. Until he meets the one woman who could change everything. Calla O’Bannion believed monsters lived only in fairy tales. The night her father was attacked and left to die, Calla knew that monsters were real. When the inevitable happens, Calla makes the decision to move home to Burn Falls and take over the family’s distillery. As fate would have it, she begins a relationship with the only one who can protect her from the thing she fears the most. Until she finds out what Draven’s been hiding. Evil has chased Draven for eighty-six years. Soon, he’ll be forced to face those demons and break his vow—a decision that could save both him and Calla. Or it could kill them both. After fled his coven, Draven Delano needed to keep a low profile for a loooong time, and being out of the radar meaned he neede to keep moving before the humans around him noticed he wasn't getting old and avoid his enemies to find him. Now he works as a surgeon, which gives him easy access to the blood bank, something that worked a lot in his favor, once Draven refuses to get his food from any living being. The thing is that it wasn't only Draven who was feeling that sensual vibes e soon things start to heat up between the vampire doctor and Calla. But Draven has some secrets that couldn't be kept for much longer... He knows what needs to be done, but Calla is irresistible and Draven just can't be away from her, even knowing that they don't have a future together. 'Burn Falls' is a book for people who wants to vary the romance reading... If you like steamy books and vampires, Kimberly Knight's new book is a good shot. 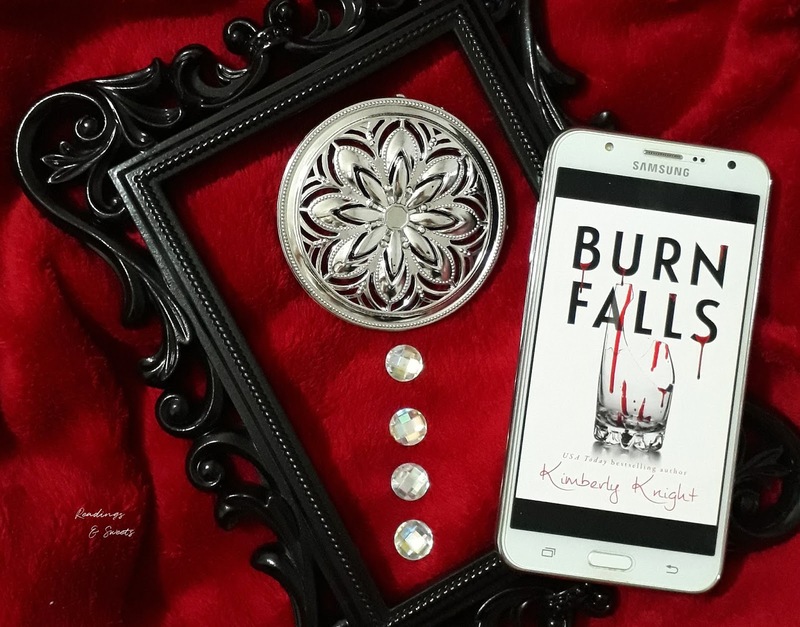 Everytime I get a book wrote by Kimberly Knight to read, I know I'll enjoy it, not even matter the plot, and with 'Burn Falls' we have excatly that! Draven is what I call a low carb vegan vampire... He doesn't eat direct from the font and does everything to avoid be in the center of the attentions, especially because he has been for so long looking over his sholder after he fled his coven. He's a character that I'd say that to me, it seems a mix between Edward and Carlisle from Twilight, but even with that resemblance, Draven still has something more to offer... You can add a lot more of spice to that recipe, I'll tell you that! Calla O'Bannion is a character one in a million... Some of her actitudes get in my nerves, like her passivity towards her mother's critics. Yeap, that scenes made me want to get in the book and slap that woman in the face! But hold you horses, because Calla is not that "damsel in distress"... Regarding Draven, she was always with her mind set on what she wanted. Now all I can think about is if Athan, Dravevn's best friend, will have a book... Asking for a friend!